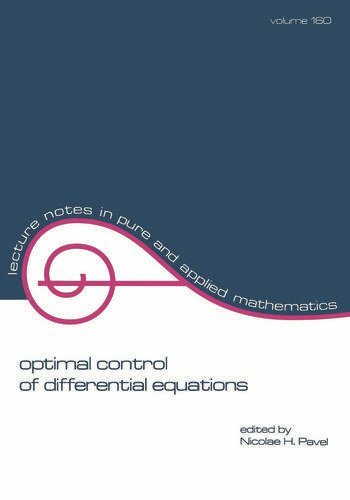 "Based on the International Conference on Optimal Control of Differential Equations held recently at Ohio University, Athens, this Festschrift to honor the sixty-fifth birthday of Constantin Corduneanu an outstanding researcher in differential and integral equations provides in-depth coverage of recent advances, applications, and open problems relevant to mathematics and physics. Introduces new results as well as novel methods and techniques!" Optimal Relaxed Controls for Nonlinear Infinite Dimensional Stochastic Differential Inclusions * Optimal Control Problems Governed by Volterra Integral Inclusions * Identifying the Nonlinearity in a Parabolic Boundary Value Problem * Optimal Control of Some PDE with Two Point Boundary Conditions * Continuity of a Parametrized Linear Quadratic Optimal Control Problem * Some Remarks on Ergodic and Periodic Control * Optimal Boundary Control of Nonlinear Parabolic Equations * Numerical Approximations to Solutions to Riccati Equations Arising in Boundary Control Problems for the Wave Equation * Well-posedness and Uniform Decay Rates for Weak Solutions to a Von Karman System with Nonlinear Dissipative Boundary Conditions * Optimal Control of Hyperbolic Systems with Bounded Variation Controls * Further Regularity Properties of the Optimal Pair in Quadratic Cost Problems for Parabolic Equations with Boundary Control and Non-smoothing Final State Penalization * Necessary and Sufficient Conditions for Optimality for Nonlinear Control Problems in Banach Spaces * Pareto Optimality Conditions for Abnormal Optimization and Optimal Control Problems * A Theory of First and Second Order Conditions for Nonregular Extremum Problems * Existence, Approximation and Suboptimality Conditions for Minimax Control of Heat Transform Systems with State Constraints * Optimal Control of Problems for Some First and Second Order Differential Equations * A Variational Approach to Shape Optimization for the Navier-Stokes Equation * On the Relationship Between the Optimal Quadratic Cost Problems in an Infinite Horizon, and on a Finite Horizon with Final Time Penalization - The Abstract Hyperbolic Case * A Sharp Result on the Exponential Operator-Norm Decay of a Family Th(t) of S.C. Semigroups Uniformly in h.
". . .warmly recommended to nonlinear analysts, physicists, engineers and to everyone who is interested in differential equations and their applications. "